I've talked about it before, so I won't go too far into it, except to say it's a fantastic game, and a great gateway from the world of D&D into lighter rules without any story-gamey kind of taint. Now, this became recently relevant when Atlas Games did something awesome, and released the rules for OtE under the OGL as the WaRP system. 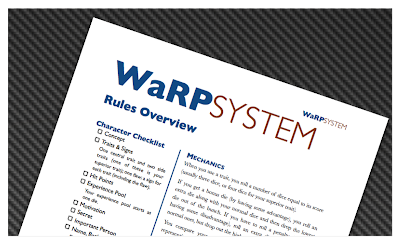 They've got a perfectly serviceable PDF available, along with the WaRP logo, but I admit, I was a little frustrated when I dug it up and tried to read it. It was pretty much pure infodump, and while that's useful as a reference, it's less useful to point people excitedly at and demand they go read it. So, predictably, I took the PDF, extracted the text, cleaned it up, and reformatted it all. Now, I'm not the Evil Hat layout guy, so this is nothing more than nice and functional, but I think it's a pretty workable copy for sharing. I've posted the pdf here and I'm considering it a draft for the time being. You spot anything wrong with it, feel free to let me know, and I'll patch it up. Now, I hope you all benefit from this, but I'll concede, this is mostly a selfish act. Not only do I benefit fromt he world learning more about the system, putting it out in this fashion makes it all the easier for me to start writing a few hacks that are based on the system. The OtE engine (which I should start thinking of as the WaRP system) has influenced a lot of my designs, so it will be fun to start mucking with it directly. EDIT - Because I'm crazy, I re-generated the doc at 5.5x8.5 for easier tablet reading or for booklet printing. Tablet sized version is here. This idea came to my while considering how to use 4e to run a Magic: the Gathering inspired game, and was refined some in discussion with Gamefiend. The problem, of course, is that 4e is not open enough to allow something like this, and there is prettymuch no likliehood of a M:tG RPG ever being something allowed within the bounds of any reality we know. But this is a fun idea, so it continues to rattle around my noggin with no hope of escape, so I've decided to finally sketch it down on paper (so to speak) just to get it out there, in part because soem recent discussion has touched upon elements of it. At its core, this sticks to the basic form of 4e, though it would pretty much toss out the existing feat list in favor of something bigger - I'll call them talents - which are effectively feat bundles. This, in turn, allows for the use of a single character class - let's call it the adept - with great depth of customization. Other changes would be within the existign scope - ritual magic would get fixed, skill list might get tweaked and, perhaps most importantly, the model of powers would get tweaked. Specifically, the only "powers" would be the at will ones. Everything else is a spell. This is, I imagine, pretty self explanatory (provided you're already familiar with 4e and M:tG). They're used the same way as powers, but you have to spend the mana to make them go. So the question is where mana comes from. In this case, that's where at-will powers come in. By and large, they're on par with basic attacks, but as an effect, they generate one mana of a specific color. Now, this means that there must be at least 5 potential at-will attacks, but will probably be more, just to cover other styles. Mundane talents provide blocks of skills, proficiencies and maybe even normal (non-charging) at-will powers. Mana talents grant charging at-will powers (probably 2 per talent) and other abilities to increase or improve the characters "mana pool"
Spell talents give spells. Honestly, I'm not sure how many spells a given talent might provide, or how to group them yet. Striking the right balance between range of options and overwhelming the player takes experimenting. It might even require some sort of "hand size" limiter, so the hero can know any number of spells, but only use those in his "hand" at any given time. And with that, you have the bulk of it. Grant new talents as characters advance, maybe tweak magic items a little so there's a bit more emphasis on items able to carry a charge of a certain color or allowing mana manipulation rather than having expendible powers of their own. So, ditch the entire list, and the whole magic-item recycling element of it. Keep some of the effects in mind. Next, add the capability to generate "non-combat" mana. I'm not really going to dwell ont his too much: it's tied to talents, and it's basically some amount of mana you can raise (but not keep) outside of combat, and possibly costs and means of exceeding that. Next any ritual may have up to 3 effect: minor, lesser and greater. Not every ritual necessarily has all three effects, but most should. Those that don't had best be kind of awesome. The minor effect (the "cantrip") of a ritual is the equivalent of a utility power, and is used the same way (and, in fact, will probably be written up as a power). The lesser effect takes a few minutes (that is, a short rest) to complete, and has a more potent effect. The greater effect takes hours (that is, a long rest) to complete and has an even more potent effect. Cantrip: Invisibility for a single round, or perhaps invisibility until you move or take an action. Something minor. Minor Ritual: Classic D&D invisibility - invisibility while you move and act, broken only when you attack or cast a spell. Major Ritual: Mass invisibility (or alternately, old 'improved invisibility'). In theory, there are "ultimate" rituals, with plot level effects, but their requirements are basically plot-device level, so there's not a huge need to dwellon them now, except to note they make good player motives if they learn one (and preventing someone else from casting one can also be a fair motivator). Talents basically affect how much and what mana you have access to, as well as how "big" a ritual you can learn. A novice ritualist might only know minor effects (aka "cantrips"), for example. There are probably even tricks for speeding up rituals with preparation, but that's a whole minigame of its own. I'll probably end up using elements of these ideas in other games. Charging powers with attacks is super useful, and the ritual magic model is one that I admit I like a lot. In a less 4e model, I might get rid of spells entirely in favor of makign them all cantrips, but that would take some experimentation (and a bit less focus on diversity of combat effects). As a final note, I obviously _could_ write this. It woudl not take much to shave the serial numbers off both components to make a non-copyright infringing game, but the reality is that I'm not sure that would be much fun. If I need to go through the effort of making it no-something else, it would probably be better to spend the effort making something new. 1 - In a perfect world, this game might be more modeled after the awesome Gamma World boxed set, in which case these modular components would be used to build a set of templates for speed of play. In this perfect world, this is properly productized and marketed, and also has rules for the mechanical use of actual M:tG cards (instead of GW's custom decks) as well as creating a setting element to allow "between game" elements to be resolved with Magic duels. 2 - My gut says 3. 1 mundane, 1 color-generating, one spell set. 3 - For example, a talent might allow you to have a built in mana charge - say, 1 green. That 1 green recovers after a short rest, so it's usually available at the beginnign of a fight. Simple enough, but I would totally demand a geomantic component - that mana comes from _somewhere_ - there's a physical location (land) which the player has attuned to that the mana comes from, and if that land is lost or stolen, the hero needs to either recover it or find a new power source to attune to. Why yes, that is a built in plot goal. 4 - There's a bit of ars magica here: greater rituals are not hobbled by dungeon balance. They're a big deal, as they should be, and a more than fair tradeoff for not choosing combat-efficacy instead. 5 - In the published version, players probably have different Combat, Ritual and Greater Ritual mana "pools" (rather than lesser and greater rituals just requiring more mana) so that cards can continue to be used as direct mappings into the game. That is, if we want to have an in game of Armageddon (3W, destroy all lands) then we declare it a greater ritual, so that the player needs to accrue 3W in that pool, something their "combat mana" won't help with. Shades of unknown armies! The 5 minute workday in the dungeon rotated back into discussion again recently. I'm not sure if the context was 5e, Dragon Age or what, but this is one of those things that pops up from time to time in discussion. I'm not going to delve too deep into this issue itself for one simple reason: this is a solved problem. Rules have been designed with robust magic systems that don't have this issue, and adventure design has (I hope to god) advanced to the point where if you tried something like this it would work about as well as you might expect (which is to say, not well at all). Seriously, if you are actually having this problem at your table, not just discussing it as a hypothetical possibility, then it's time to check your fundamentals and hit the weights. But if you're working to avoid this problem, then you have my sympathy, because there definitely are games that reward this behavior, and it can really feel like it's your fault. Odds are, it's not. Most likely, it's a failure of the fiction. A failure of the fiction is something that occurs when you stop and think about how things work and conclude that something really dumb is afoot here. Often, these are rules constructs that we ignore for the same reason we do puppeteers - the most famous example of this being hit points, and what exactly they mean in the context of actual reality. The image of the high level fighter walking around filled with arrows and feeling fine is a common touchpoint for D&D humor. These things can violate our common sense, but we can tolerate them to a point, so long as they make the game more playable. For magic, things get much more complicated. Because we don't have a personal frame of reference for how magic works, we are dependent on the rules to establish our common sense, and we don't have the same buffers in place to fill in the gaps. We understand the silliness of a "hit point" and we can at least try to not do things like jump off cliffs because we can totally take that 10d6 hit (or at least recognize it as preposterous), but we have no such check in place for a "mana point". There is no "gut check" to say that it's stupid to burn all your mana at once. The only guideline is the rules, and the rules generally don't necessarily have very good judgement. And the problem is, of course, that magic is very rarely that mechanistic in fiction (even in the fiction based on these games). It has a logic and a sensibility that writers seize upon, usually by departing from the magic as presented in the rules. And that's the rub: the creation of a magic system is a profound act of worldbuilding, but when a game design fails to bear this in mind, you get crazy disconnects. Now, the good news is that lots of games have solved this problem. There are tons of games with flavorful, reasonable (yet still magical-feeling) magic systems. And they totally deserve to be stolen from. 1 - If you don't know the term, it comes from a practice in older editions of D&D where the spell casters would load up on spells, then the party would walk into the first room in the dungeon and unload all of their most potent spells to overwhelm the opposition. Then they'd bar the doors and rest for however long it took to recover and re-memorize the spells, then proceed to the next room and repeat the process. It was neither heroic nor adventurous, but it was super efficient. Most games where Magic is a limited, burstable resource run into this problem. Jared von Hindeman dropped a phrase in twitter today which struck me as a very good way to describe an idea that's been running through my mind a lot lately - "Rules Blind." Running a game rules blind means that the players need not know any of the rules to play. Jared proposes it in the context of getting players interested - run the first session rules-blind, and if the players have fun, they'll have the interest to then read up on the system and setting themselves. It's a good idea, but I'm mostly grateful for the term. It's useful because certain games are very problematic to run rules blind, and that distinction highlights a point that's very important to me. In many ways it speaks directly to the role of fiction in the game, and how it interacts with rules. Specifically, it addresses whether fiction or rules drive play. Howso? Consider a game like 4e, where there are a large array of action which have specific mechanical meaning. If you want to knock one opponent into another one, then you need to have the power that does that - there are no rules for that activity outside of the power. That would make is crazy difficult to run rules-blind because if the player doesn't know his powers, he's got no real means to engage the game. This applies similarly to Apocalypse World and its variants, though perhaps to a lesser extent. Most actions are explicitly framed as moves, with specific mechanical limitations on what can be accomplished within their bounds. There's a bit more leeway here - a GM could internalize some of the more common rolls and just ask the player for a number - but that won't work in every situation. Now, please note this is not a criticism. In both cases, there are tradeoffs being made that are quite valuable. 4e's explicit menu of choices makes combat paralysis less overwhelming, and Apocalypse World's moves subtly (or not so subtly) drive play towards drama. In fact, these represent useful advances in game design - in both cases the rules are very explicitly engaged to drive play in an intended direction rather than just being presented as something neutral which depends on the GM to drive things. Unfortunately, they also take things in a direction that's not to my taste. Now, it would be easy to frame my taste as "fiction first", but that would be a little passive aggressively self-aggrandizing, and not entirely true. If I were really fiction first, I'd be much more engaged by games like Primetime Adventures (a game which, like 4e and AW is brilliant and fun, but not my sweet spot), but the reality is that the fiction, to me, is more place than story. I seek the limitations and interactions more than any narrative. And that's where rules-blind comes in for me. It's a litmus test for the things I like in a game for the simple reason that if a player engages the setting and tries interesting stuff, I want him to be supported by the system, and I want it to feel like an organic extension of the sensibilities of the table. And that's why this is not quite a "system doesn't matter" argument, though it's certainly in the family. I could run Feng Shui or Rolemaster rules-blind, and the outcomes would be VERY different. Problematically so if player's expectations differ from what those the system provides. Lining up a system to expectations is still super duper important (but playing rules blind can also provide an interesting window into what those expectations actually are). None of this is really guidance for how someone else should run or play a game, but it's working through my mind as I think about the kind of game I want to run (and a bit as I slowly write ICT). And I'm mostly thanking Jared for the extra club in my bag. 1 - There's nothing that says the 4e framework couldn't be expanded to handle such things, but by its vanilla rules, that's the shape of it. - Which is, I should add, one of the great reasons for players to learn the rules - shared rules are a fast route to shared expectations. Dice are, to me, an answer to a question. If I already know the answer to the question, I'm not sure what dice have to offer. If I don't know the answer, then yes, dice are great. Where it gets weird is when I have one answer to the question and another player has a different answer. Dice are absolutely a way to determine which answer is right, but I am starting to wonder if it's a good way to do so. it feels like throwing out some amount of mojo (and consciously avoiding a shared understanding) in favor of oddly shaped oracles. In the absence of dice, such a disagreement might be born out of hidden information - you as the player may think your guy is a better swordsman than the black knight, but I as the GM may have a different understanding. That's fine, that's high-trust GMing, but it works. On the flipside, dice make a lot of sense in the absence of hidden information. if the players know everything the GM does, then there should be clear consensus regarding which questions don't have clear answers. But when there's hidden information and dice? That seems like an invitation to trip over your own feet. It's also the most common arrangement in gaming, so it can obviously work, and that fact casts an interesting light on the role of trust. The success of hidden information corresponds directly to trust, which seems obvious, but gets interesting when you realize that dice are often considered arbiters, more 'fair" than the GM. And that seems self contradictory - trusting the GM enough to allow hidden information but using dice as some sort of totem of GM distrust seems... kind fo screwed up. None of which is to say dice are bad. But it's making me think a lot more about those times reflex demands that I turn to them.